Whew! We had a crazy, event-filled Thanksgiving weekend! 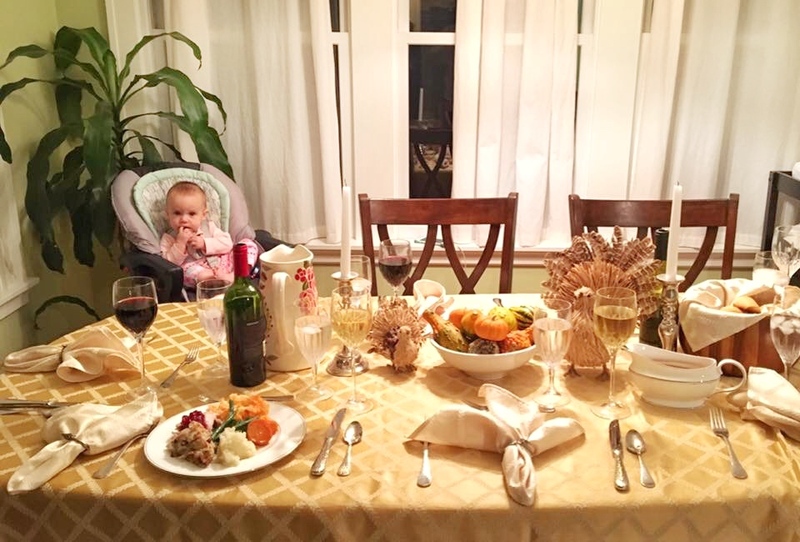 We hosted Thanksgiving at our home this year for the first time. Thankfully, I have wonderful in-laws who were willing to travel for the weekend, so we were able to celebrate both the Thanksgiving holiday and Mae's Baptism surrounded by family! For our first attempt at cooking a turkey, we actually made two: a traditional one in the oven and one in the smoker (which we brined the night before). That gave us plenty of leftovers and a back-up bird in case of disaster. Fortunately, both were delicious! We also had gravy, mashed potatoes, sweet potatoes, turnips, green beans, cranberry sauce, and dinner rolls followed by pumpkin pie and apple pie. Mae stuffed herself on rice cereal and sweet potato purée. This was an excellent excuse to bring out all my fancy table linens, china, and crystal! Tim took this photo, which he captioned, "The Queen is in her throne ready for the feast". Saturday morning, we bought a new car to replace our totaled sedan. Dan's dad came along to provide some much-needed advice and moral support. 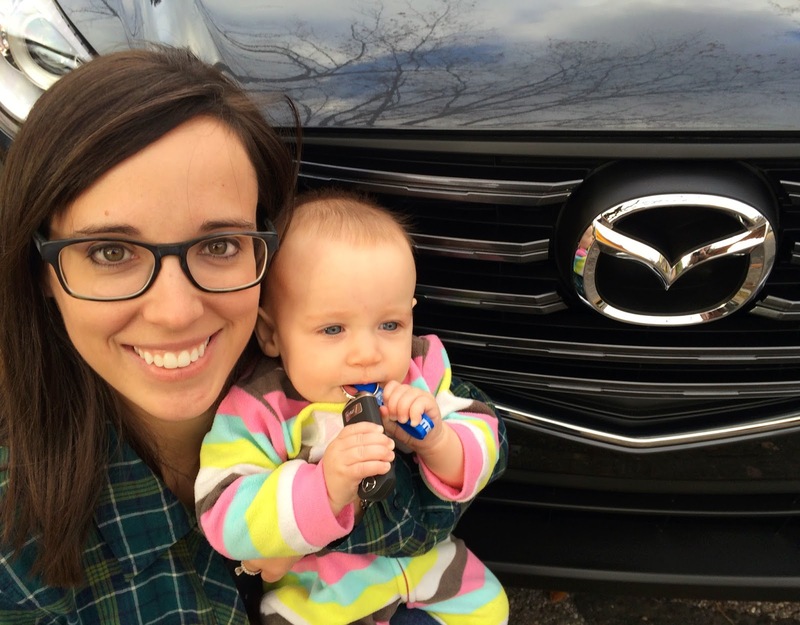 We test drove a couple vehicles and settled on a Mazda CX-5. I'm enjoying all the bells and whistles like navigation, bluetooth, and heated seats. Mae is enjoying the chewy keychain. Everyone stuck around for Mae's Baptism on Sunday, and my family, including my Aunt Ruthann and Uncle Tim, came in for the day also. Another boy was baptized during the same ceremony, and, shockingly, Mae was the better behaved kid! She only looked a bit confused when the water was poured over her head. We took lots of family photos afterwards! Mae enjoyed chewing on her baptism garment. Here we are with Mae's godparents, her Aunt Colleen and Uncle Christopher. We hosted a little reception at our house afterwards. Mae and Ollie were happy to get some play time together, and we enjoyed visiting with both our families!